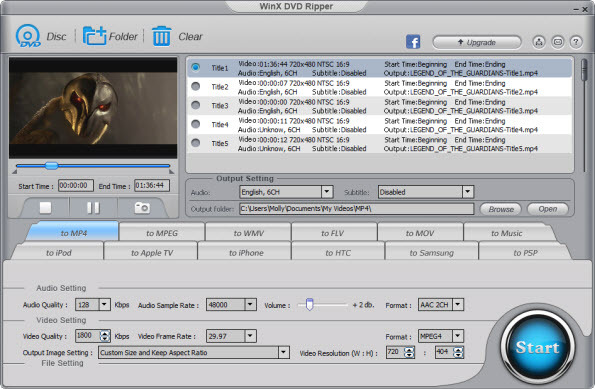 WinX Free DVD Ripper helps you rip DVD on Windows 10 to MP4, H.264, DVD to MPEG, DVD to WMV, FLV, MOV. ItÃ¢â‚¬â„¢s the best free DVD ripping software for Windows 10/8/7, etc. Step 1. Load DVD Movie from Windows to this free DVD ripper by clicking Ã¢â‚¬Å“DVD" or Ã¢â‚¬Å“+Ã¢â‚¬Â�. Step 3. Hit Ã¢â‚¬Å“StartÃ¢â‚¬Â� to rip DVD for free.